Exemplified by the cancer cell's preference for glycolysis (the Warburg effect), altered metabolism has taken centerstage as an emerging hallmark of cancer. Charting the landscape of cancer metabolic addictions should reveal new avenues for therapeutic attack. Two recent studies found subsets of human melanoma and breast cancers to have high levels of phosphoglycerate dehydrogenase (PHGDH), a key enzyme for serine biosynthesis, and these cancer cells are dependent on PHGDH for their growth and survival. Tumors may thus harbor distinct metabolic alterations to support their malignancy, and targeting enzymes such as PHGDH might prove a viable therapeutic strategy in this scenario. Recent advances in understanding the metabolic alterations in cancer cells have shed light on how tumors fuel rapid growth by preferentially engaging biosynthetic pathways [1, 2]. Although cellular metabolic pathways are rich pickings for drug targets, pin-pointing enzymes that critically contribute to tumor metabolism is key to establishing a therapeutic window since most of metabolic enzymes also play important roles in normal tissues. Two recent studies explored the landscape of tumor metabolism using different approaches, yet both identified the enzyme phosphoglycerate dehydrogenase (PHGDH) to be critical for the viability of a subset of breast cancer cells that overexpress this enzyme [3, 4]. Possemato and colleagues conducted an elegant in vivo shRNA drop-out screen to identify metabolic pathways that might be differentially required for the viability of cancer cells. The authors transduced a lentiviral shRNA library targeting 133 metabolic enzymes and metabolite transporters into the human breast cancer cell line MCF10DCIS.COM. These cells were then injected into mice to establish xenograft tumors. By analyzing which shRNAs disappeared from the library in the tumors, they were able to infer several metabolic genes to be necessary for the growth of tumor cells in vivo. PHGDH is among the several genes identified in this screen. Locasale and colleagues homed in on PHGDH from a different angle. By analyzing glucose flux in the trans-formed HEK293T cells, they found a high flux of glucose towards glycine production that can be attributed to the serine biosynthetic pathway . PHGDH is the first enzyme in this pathway that diverts glucose from glycolysis to serine production. By analyzing cancer CGH and gene expression data, both groups noted that PHGDH is amplified or over-expressed in a subset of melanoma and breast cancers. In breast cancer, elevated PHGDH is more frequently found in estrogen receptor-negative and basal-like tumors. Strikingly, whereas RNAi-mediated depletion of PHGDH has little effect on the viability of untransformed breast epithelial cells or breast cancer cells without PHGDH amplification/overexpression, depleting PHGDH strongly inhibited the proliferation of a panel of breast cancer cells where PHGDH is amplified or overexpressed. This latter group of cells thus exhibit functional addiction to PHGDH. Furthermore, using an inducible PHGDH shRNA in the breast cancer MDA-MB-468 cells (which carry PHGDH amplification), Possemato and colleagues showed that depletion of PHGDH also inhibited tumor growth in vivo . PHGDH catalyzes the first step in the serine bio-synthetic pathway (Figure 1). This pathway diverts a relatively small fraction (<10%) of 3-phosphoglycerate from glycolysis to generate serine as well as equimolar amounts of reduced nicotinamide adenine dinucleotide and α-ketoglutarate. Indeed, Possemato and colleagues showed that two other enzymes in this pathway, PSAT1 and PSPH, also have higher expression in estrogen receptor-negative breast tumors, and RNAi knockdown of PSAT1 and PSPH selectively impaired the viability of breast cancer cells harboring PHGDH amplification . Serine biosynthetic pathway. In vivo shRNA lethality screen and metabolomic profiling independently identified 3-phosphoglycerate dehydrogenase (PHGDH) to be essential in a subset of cancer cells that overexpress this enzyme. PHGDH plays a key role in serine biosynthesis, and cancer cells with high PHGDH activity might be addicted to this pathway for their viability. αKG, α-ketoglutarate; NADH, reduced nicotinamide adenine dinucleotide; PSAT1, phosphoserine aminotransferase 1; PSPH, phosphoserine phosphatase; TCA, tricarboxylic acid. So do tumor cells with high levels of PHGDH need more serine for growth? Here the answer becomes more complicated. Locasale and colleagues found higher levels of PHGDH were associated with higher serine production in melanoma cells and, conversely, that RNAi depletion of PHGDH decreased serine production . On the other hand, Possemato and colleagues noted that breast cancer cells with high levels of PHGDH are resistant to serine withdrawal and their loss of viability upon PHGDH knockdown cannot be rescued by supplemental serine. 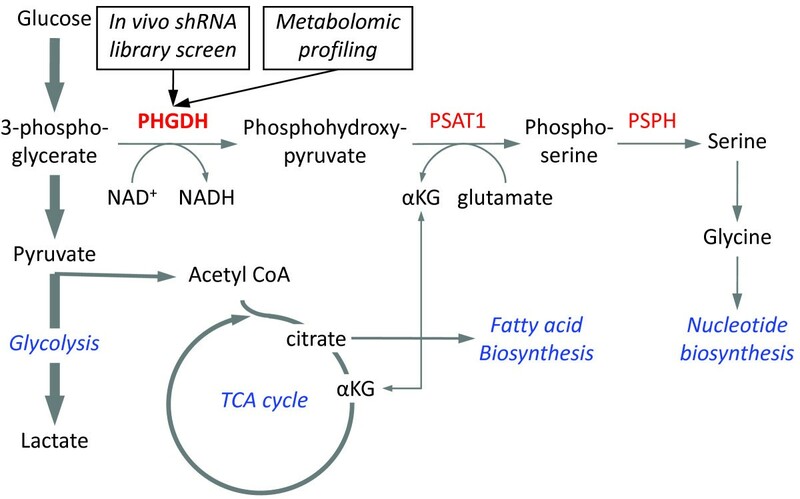 Instead, the depletion of PHGDH in breast cancer cells leads to a decrease in the level of α-ketoglutarate, a key biosynthetic precursor in the citric acid cycle. However, loss of α-ketoglutarate upon PHGDH depletion was not observed in melanoma cells by Locasale and colleagues. The same addiction to PHGDH therefore might manifest as distinct metabolite addictions - some cell lines might require serine, others α-ketoglutarate, and still others reduced nicotinamide adenine dinucleotide. Indeed, metabolic profiling showed that the levels of many metabolites are altered upon PHGDH knockdown. Intriguingly, PHGDH overexpression might directly promote oncogenesis. Using the MCF-10A breast epithelial cell morphogenesis assay in 3D matrigel, Locasale and colleagues showed that overexpression of PHGDH in these cells increased their proliferation rate and disrupted the acinar structure of these cells. A change in cellular serine metabolism could thus directly lead to altered phenotypic behavior that favors transformation. Understanding how this happens would shed new light on the metabolic mechanisms of oncogenesis. The studies by Possemato and colleagues and Locasale and colleagues strongly implicate PHGDH as an attractive drug target in the subset of tumors that amplify or overexpress this gene. As PHGDH-dependent serine biosynthesis operates in all cells, it would be important to determine whether a sufficient therapeutic window exists. Congenital mutations in PHGDH have been documented in humans and result in serine deficiency disorders. The main manifestation of this disorder is severe neurological symptoms of the central nervous system as serine does not cross the blood-brain barrier and consequently neurons and glial cells entirely rely on de novo serine synthesis . Similar central nervous system disorders have been observed in PHGDH knockout mice . Despite these manifestations, PHGDH inhibition remains a viable cancer therapeutic strategy for two reasons. First, a PHGDH inhibitor designed not to cross the blood-brain barrier would not interfere with serine homeostasis in the central nervous system, thus avoiding potential neurological side effects. Second, serine deficiency disorders can be treated by exogenous serine supplement, whereas tumors' addiction to PHGDH might not be associated with serine flux. A PHGDH inhibitor that is non-permeable to the central nervous system coupled with serine supplement might thus provide the therapeutic index needed to selectively target tumor cells.